Joe Sample, piano; Stix Hooper, drums. 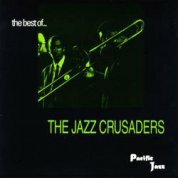 When the The Jazz Crusaders came to Los Angeles in 1958, they were first billed as the Modern Jazz Sextet. The lure of a recording contract caused the move from Houston but the date never materialized. The L.A. jazz scene was small and competitive at the time. Work for the transplanted group was difficult to find. The core of the aggregation, pianist Joe Sample, tenor saxophonist Wilton Felder, trombonist Wayne Henderson and drummer Nesbert "Stix" Hooper had been playing together since high school and together were a collective road map of experience. They kept together during the lean years in Los Angeles by playing rock and roll and soul, whatever paid the rent. Augmented by guitar and bass, the above four were first recorded in May of 1961 by Richard Bock, founder of the Pacific Jazz label. Their propulsive sound and intricate ensemble work instantly drew critical praise and sales success. Their second date in January 1962 produced a near hit with "The Young Rabbits" wich kicks off this collection. The dynamics between Felder's sax and Henderson's trombone may bring to mind another popular ensemble of the early sixties, Blakey's Messengers, but the absence of a trumpet in the Jazz Crusaders front line helped to define their sound and separate them from the pack. Bock recorded the group at the now legendary Lighthouse in Hermosa Beach in the summer of 1962. It is on these bruning takes of "Appointment in Ghana" and "Congolese Sermon" that the hard-edged brilliance of the group shines through. The bass chair of the Jazz Crusaders rotated among various talented musicians. Victor Gaskin gigged and recorded with the band for a couple of years. In 1964 the Jazz Crusaders toured with Wes Montgomery's brother Monk on bass and recorded the guitarist's "Out Back" with Joe Pass on their Stretchin' Out LP. The final selection, "Fire Water," finds the group heading in a far different direction than they ultimately took a few years later when "Jazz" disappeared from their name. Felder is given plenty of space on Buster Williams' tune which leans towards a modal, post-post bop sound. When the Crusaders burst onto the pop radio scene of the 1970s, few of their millions of young fans knew of the formidable jazz roots laid down by this cooking West Coast ensemble. --TOM EVERED, from the liner notes.